With Father’s Day exactly one week away, Amazon just launched a phenomenal deal on the perfect gift for any father who likes to cook. Oh, and it’s also the perfect gift for yourself. 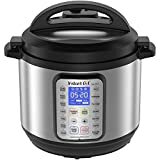 The family size Instant Pot DUO Plus 8 Qt 9-in-1 Multi- Use Programmable Pressure Cooker is the best model Instant Pot makes, and it’s priced accordingly at $160. Thanks to Amazon’s big deal of the day, however, you have save a whopping $60 and snag one for $99.95. That’s the lowest price ever for this insanely popular model, and it’s only good on Sunday.